BD-ROM or Blu-ray Disc Read Only Memory is a high definition optical disc storage format of the Blu-ray family that consists of pre-recorded data. BD-ROM can only read audio and video information. It is the BD variation specifically designed for high definition movie and game content, with multi-channel audio, super navigation options, and stunning visual results. Some of the first BD-ROM titles released in 2006 included 50 First Dates, Hitch, The Terminator, and The Fifth Element. With the rising popularity of 3D movies, the capacity for 3D playback is now available with BD-ROM. A single layer BD-ROM starts with a polycarbonate layer molded with spiral grooves that circle the diameter of the disc and contain microscopic pits of binary data. A metallic alloyed layer is added for reflection followed by a polycarbonate-based cover layer. The disc is then topped with a hard-protective coating. The dual layer BD-ROM also has a polycarbonate layer followed by a reflective metallic layer. However, a space layer adhesive with a second track of data is added. This is followed by another reflective layer, a polycarbonate-based cover layer, and a hard-clear topcoat. Based on the construction of single and dual layers, a laser does not need to travel through layers to access information, thus allowing future flexibility in the composition of BD-ROM discs. BD-ROM discs are available in various capacities depending on their number of layers and video compression standards, and storage technology is only expanding. Capacity starts at a single layer 25GB disc by MPEG-2 that holds 135 minutes of HD audio/video with three audio languages and two bonus ours of SD. A dual layer by AVC compression holds up to 50GB with eight hours of HD features, three audio languages, and more than three hours of HD bonus features. The content of a BD-ROM disc is protected from illegal copying through three layers of digital rights management. The Advanced Access Content System (AACS) uses an encryption system with 128-bit keys and other key blocking. This system has gone through several encryption cycles to thwart ongoing format attacks. BD+ is the second content protection system built into authorized players. 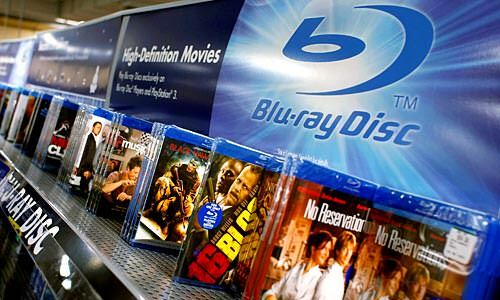 It tries to prevent illegal copies of Blu-ray discs or the playback of illegal discs. BD-ROM Mark is another safeguard system engineered to prevent piracy of BD-ROMs. Authorized manufacturers have exclusive access to this encryption system and digital signature, which allows BD-ROM media to be correctly recognized.